Luxury and privacy meet at Maui Kamaole, located just minutes awayfrom the three sunny Kamaole beaches. This modern condominium complex features tropical gardens, heated pool, jacuzzi, BBQs and its own activities and information desk. Both one and two bedroom units provide many extras including two bathrooms, air conditioning, cable TV, VCR, telephone, washer/dryer, as well as a fully equipped kitchen. The spacious lanais offer spectacular views and a true taste of Hawaiian living. 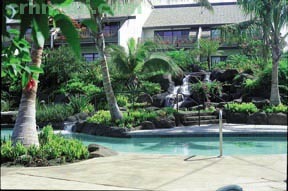 Make a splash in one of Maui Kamaole's two pools. The newest pool features a waterfall, and lush tropical gardens. High Speed Internet Service now available. Rates subject to 11.42% (12242% as of July 1, 2009) Hawaii Sate Excise & Accommodation Transient Tax and $35 registration fee.